One of the most eagerly awaited (and pre-ordained) reunions in metal history has finally taken place, and the recorded results are here at last. The first JUDAS PRIEST album in nearly 15 years to feature original vocalist Rob Halford, "Angel of Retribution" may not be the masterpiece some were expecting (perhaps the hype had something to do with that), but is nevertheless a vigorous return to form for one of heavy rock's most important acts, and a solid slab of traditional metal in its own damn right. With all due respect to interim PRIEST vocalist Tim "Ripper" Owens, who possessed a killer set of pipes and natural stage presence, guitarists Glenn Tipton and K.K. Downing have sorely missed the third part of their writing triumvirate, as evidenced by the less-than-stellar albums PRIEST recorded in Halford's absence. The combination of his vocal melodies and arrangements with the endless riffs and leads that Tipton and Downing are capable of generating have always formed the bedrock of PRIEST's sound, allowing them to experiment — sometimes not always successfully — while retaining a distinctive signature style. 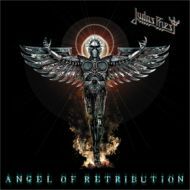 Thus it's appropriate that "Angel Of Retribution" seems to celebrate the many varied stages of PRIEST's musical evolution, from the driving power of "Hell Bent For Leather" (1979) to the anthemic sounds of "British Steel" (1980) to the power metal of "Painkiller" (1990). The band even reaches back to its earliest moments, like 1976's "Sad Wings of Destiny", on the epic album kickoff "Judas Rising", whose opening pays homage to the classic "Victim of Changes". More surprising are the slower songs: "Angel" not only channels "Beyond The Realms of Death" (still one of the band's greatest moments) but "Eulogy" has moments that are reminiscent of even more obscure ballads like "Epitaph". Don't think that this is an oldies show, however. The PRIEST maintains a modern edge on tunes like the pulsating "Deal With The Devil", an instant headbanging classic, and the ominous "Hellrider", with its almost SLAYER-like licks. Tipton and Downing deliver the goods effortlessly, while bassist Ian Hill and drummer Scott Travis remain one of the most unobtrusive, and therefore reliable, rhythm sections in metal. And then there is the Metal God himself. Sounding as majestic as ever, reaching from chest-pounding war cries to full-throated screams, Halford's total commitment and control still set the standard for metal vocalists everywhere. While his work with the HALFORD band was nothing to be ashamed of ("Resurrection" is arguably the best PRIEST album the original band never made), he has clearly come home. On the downside, Roy Z. 's production and mix could have a little more thump, but luckily the songs and musicianship transcend that slight drawback. And it's difficult to say whether this disc could ultimately rank among the band's finest albums. That being said, JUDAS PRIEST could have simply slapped together a greatest hits collection, recorded one or two new songs, and reaped the benefits of nostalgia on tour for the next year or two. But this band has never shied away from plunging forward, and "Angel of Retribution" is a fearless exploration of whether the original magic could be recaptured. For the most part, it has worked. As Halford himself would scream, the PRIEST is back.